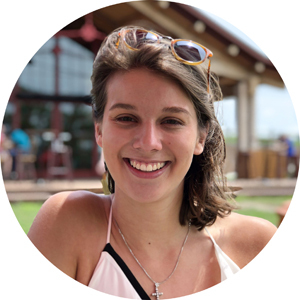 Phoebe Forlenza was selected as a 2018 Global Citizen of the Year Finalist for her work with Comune di Milano's Center of World Cultures. She created lasting change in the lives of refugees, migrants, and immigrants who benefitted from her Italian translation skills and dedicated personalized support. The Global Citizen of the Year jury particularly appreciated how she articulated wanting to use her "education, time, and privilege to create a more equitable country and world" and her proven commitment to do so in Milan. Her continued involvement with refugee and migrant issues through study and research demonstrates her well-rounded approach to social justice and global citizenship. Take us back to the beginning of your study abroad experience. What made you want to study abroad? Why Milan or why Italy? How did your journey begin? I decided to study in abroad in Italy mainly because my father is from Italy. He was born in Naples and came to the United States when he was around my age, around 20-21 years old, first to study, and then he ended up staying. So I have a serious personal connection to Italy. Most of my family, especially on his side, is still there. I have family in Naples and family more in the center of the country as well. I've always had a tie towards there. I've always had a passion for the language. I've learned it a bit in the house growing up and studied it in school as well. And one of my major goals for study abroad was to gain complete fluency in the language. So my decision to go to Italy was pretty straightforward, whereas my decision to go to Milan wasn't so much so. Milan, I actually never been to until I decided to go there. When I landed on January 15th last year, that was my first time in Milan. So that was a totally new experience for me, and it was pretty different from the Italy I knew. It was a lot more modern, a lot more cosmopolitan, subway system works, etc., which isn't necessarily true in many other parts of Italy. That in itself was a very interesting experience for me. So beautifully said. In your words, why do you feel it is important to leave one’s comfort zone? And what made you choose service learning as a step towards accomplishing this goal? 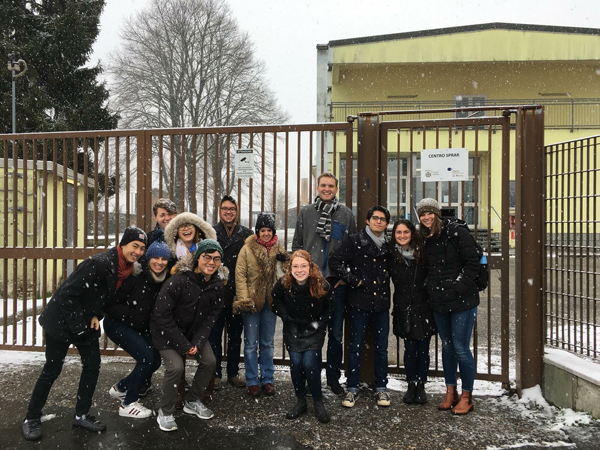 In terms of my service learning work while I was abroad, I remember distinctly feeling like in the first few days there I really liked IES Abroad Milan. I really liked the friends I was making. I was very confident that it would be a successful semester. However, I was also looking for an opportunity to kind of go beyond that, to really turn this into a period of personal growth for me. I had studied abroad in Prague for one semester in high school, my second semester of sophomore year, and I remember that being probably the most transformative period in my life. And I just remember really wanting to get that same feeling out of studying in Milan. And I felt like if I got a little too comfortable with what everyone else was doing, maybe it would've just been a fun semester, but not exactly transformative like I wanted it to be. So I viewed service learning as my vehicle for doing that. The way the course was advertised, it was not necessarily volunteering in the sense of working at a soup kitchen or what you stereotypically think of what volunteering looks like, but it was much more hands-on, much more grounded in the major issue in Italy right now, which is migration. And although I'd read about this stuff in papers, I'd never yet seen it in action, and it's prominent in Milan perhaps even more so than in other parts of Italy. So that was, I think, an incredibly important move that I made in deciding to enroll in that course. It ended up being a very influential experience, and I'm very happy I did that. I think it's incredibly important to leave your comfort zone, because that's how you grow. That's how you learn more about yourself and more about the world around you. Although it's uncomfortable to leave your comfort zone, it's hard and it's unsettling at times, the reward is always so monumental that you kind of look back and say, "I don't know how I did it, but here I am, and this feels great." So I'm all for leaving your comfort zone. And as I just described before, I think service learning is an incredible vehicle for doing so. I think it gives you all the tools. It doesn't hold your hand in doing so, but it gives you the tools. 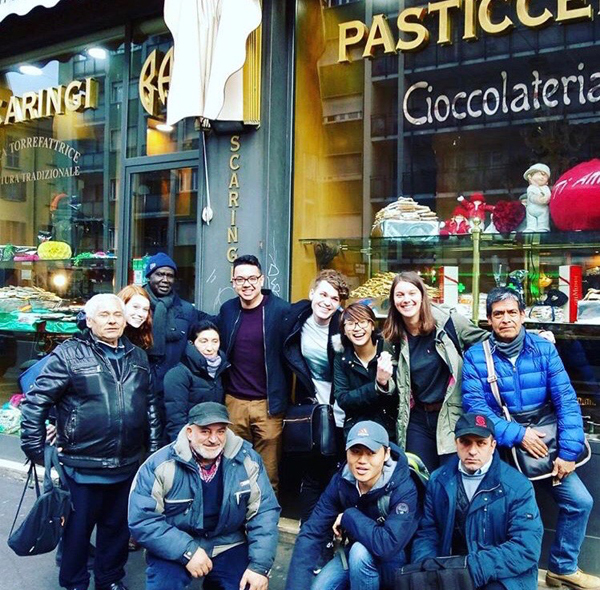 In my experience, specifically, it gave me the connection to work at the Comune de Milano, volunteering there on a weekly basis and communicating with these people, perhaps in a way I would not have been able to do if I had not gone through the service learning program. I think I had a positive impact on the world through study abroad because it forced me to face my own privilege. I consider myself pretty socially conscious and have for quite a while, though I think my time in Italy was a bit different in the way it forced me to view it. I have usually placed myself in the context of American social equities, whereas this put me in a kind of a realm of migration, which I had never yet experienced. So through my volunteer work at the Comune de Milano, I was helping with these translations, helping describe the situations of migrants to the Italian social workers, their trips as well as their visa system, visa application process, and their housing situation. This reflection ties so closely to something we speak of often: the power one individual can have on another’s life. Share your thoughts with us on this topic. How was this present in your service learning experience? I think, as listed here, that the quality of my translation was very likely indicative of the quality of their stay in Italy because the social worker that I was volunteering for was reliant on the quality of my translation. If I had failed to adequately translate something or if I neglected to communicate a detail that the migrant was trying to communicate, then that was lost in translation, and neither the social worker nor the migrant would have picked up on that. So it was absolutely stressful. I felt like I had a lot of responsibility. At times, it was very, very tough. Though I consider myself fluent, sometimes the vocabulary wouldn't come to me or some of the words were too technical, or I hadn't experienced some of these words in relation to migration or visa applications and things like that. So it was complicated, and it forced me out of my comfort zone absolutely every time I went in. But I think it was just an incredibly, incredibly important experience to have as well. And I think, as a result, I ended up really contributing to both the experience of the migrant as well as the [Comune de Milano] center who did not, at the moment, have an English translator. What did you learn about the world through your experiences in Milan? I learned a whole lot about the world through my experience in Milan. A lot of it, like I said, through the lens of migration. And to make that more broad, I had learned that the world's most complex issues, the issues that we think are the most hot button right now which we see as a little black and white when we read them online, it's easy to see a ship of migrants in the New York Times and say, "Oh my God, that's horrible. We need to help these people. How are people not doing something about this?" etc. It's very easy to take a side when it comes to stuff like that. But when you see this in practice, you see the Italian social workers who don't have the resources to better accommodate these people when you see migrants on the street in Italy asking for money on every corner because none of them can find jobs. It makes you wonder exactly where the root of the problem is and what we can really do. Because a lot of the times, we apply these blanket accusations that they're not doing what they're supposed to be doing. And my time in service there, they made me wonder, "Well, who is the they? Is it the Italian government? Is it the social workers? Is it the EU?" These are all very important questions that even after my time I don't necessarily have the answer to. And I think most people don't have the answers to those questions. So I say most broadly, it's just understanding the complexities of the situation. Don't just think there's a yes and no question, but more, "what is the situation? ", "what can we potentially do about this?" In my time in Italy, I had learned that I'm perhaps a little too ambitious when it comes to solving these problems. I think my social conscience really came into play in the beginning of my college career. When I decided to be a political science major, it was very clear to me that this is what I cared about. And I've never really doubted it since then. But I think I was a little too optimistic back then. Like I said before, I thought things were a little more black and white than they are. I didn't exactly understand how hard it was to change some of these things. I learned that although I am very passionate about these things, it's incredibly important to understand all sides of the story, to understand why people are thinking about it the way they are, what details are factored into them, how an issue can affect them differently than it's affecting myself. In turn, why that's making them have the stance that they have. So not to be so ambitious and so kind of bulldozer-y in my approach to these social issues, but really try to understand all sides of the story. I think this has really, really shaped who I am, and it's shaped my future. Right after I came back from study abroad, I took a course at my school on migration and human rights where I actually wrote a 35-page mini-thesis on the socio-economic integration of migrants into Italian society. So rather than just discussing the migration crisis broadly, I decided to examine exactly how or if they're integrated adequately into Italian society, both socially and economically. So I did essentially what I was doing while I was abroad, but then I looked at it through an academic lens while also applying some of my personal experiences. That was a really, really interesting process for me. I was doing a bit of the reverse of what I guess most people do. Most people would probably study it academically and then go into the field. Whereas here, I did the hands-on stuff, and then came home and studied it. So that was really interesting for me just to see where there were gaps and expectations of reality and where things really aligned. If I can give one piece of advice to future study abroad students, I would just say try to push yourself out of your comfort zone in every way you can. Although it's easy and it seems fun to just fall in with the rest of the crowd, I would say maintain those friendships. Meet new people. Go places. Go to new cities. Go to new places on the weekends, but also find your own outlet. Find something, whether it's service learning, volunteering, or whatever it may be for you that gives you the opportunity to grow personally as an individual, rather than as a group. Although it's uncomfortable to leave your comfort zone, it's hard and it's unsettling at times, the reward is always so monumental that you kind of look back and say, "I don't know how I did it, but here I am, and this feels great." Get inspired by our 2018 Global Citizen of the Year winner and finalists who are doing just that.